In a mixing bowl combine the powdered sugar and butter. Cream butter and sugar until light and fluffy. Add the all purpose flour/maida to butter mixture and mix well. Add the flour mixture and cocoa pwd to butter mixture and mix well. Take the dough out, and roll between two butter paper or plastic wrap ( this makes rolling easy). Preheat the oven at 170 deg C for 8-10 mins. 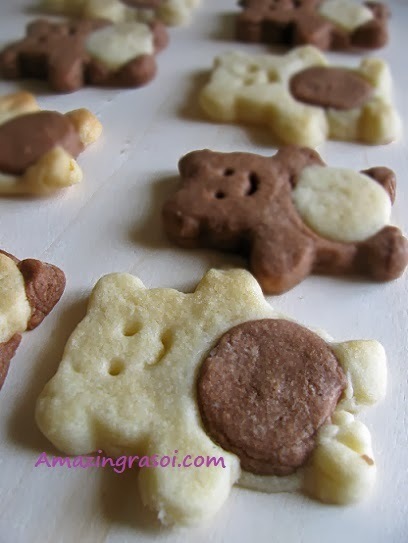 Cut the rolled dough with a teddy cookie cutter. 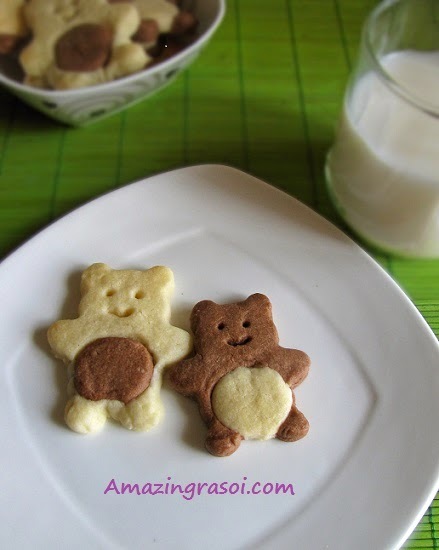 To make the bellies of these teddy, take a tiny round cookie cutter and cut a circle out of a vanilla teddy and set it aside. Cut a circle out of a chocolate teddy and set it aside. Now swap them. Place the chocolate circle into the vanilla teddy and vice versa. With help of toothpick make eyes and mouth of teddy as shown in pic. Place the cookies on the lined butter paper leaving space between each cookie. Bake it at 170 deg C for 10-12 mins or until the edges are slightly golden brown. Once done then transfer these cookies carefully in a rack and cool it. Store in airtight container. Check the cookies after 10 mins as the cookies tend to easily burn. Make sure to take out when the edges start browning. It will be soft when taken out, will become crispier once cooled down. If you are baking in batches then keep the remaining cookies which are already cut,in the fridge. Here to make bellies I have used small size cap to cut the bellies.